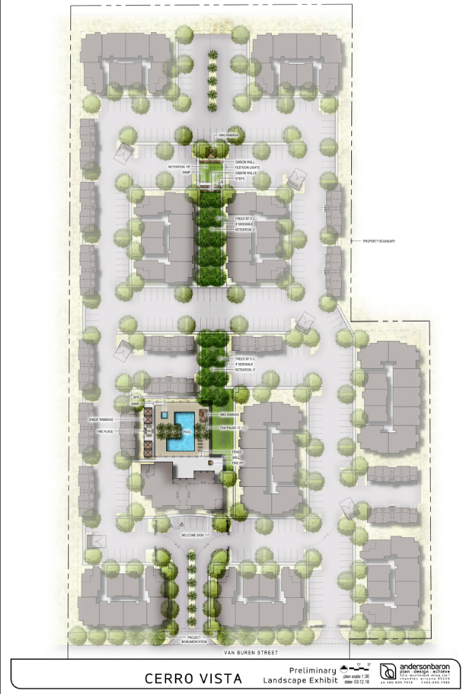 What do you think of the proposed Cerro Vista development located east of the northeast corner of Fairway Dr. and Van Buren St.? Applications #PL-18-0079 (General Plan Amendment) and PL-18-0080 (Rezoning): Concurrent requests by Mr. Ernest Amponsah, Quyp Development Services, LLC, for a General Plan Amendment and Rezoning concerning approximately 11.4 gross acres of undeveloped land located at 12106 W. Van Buren St. The General Plan Amendment request (Application PL-18-0079) will change the land use designation of the property from Urban Residential to High Density Residential. The High Density Residential land use designation allows for development of patio homes, apartments, condominiums or townhomes with a density ranging between 12 and 30 dwelling units per acre. The accompanying rezoning request (Application PL-18-0080) will rezone the subject property from AG (Agricultural) and C-2 (Community Commercial) to PAD (Planned Area Development), allowing for development of a high density urban living residential development with a proposed density of approximately 21 dwelling units per acre, 234 overall units planned. The project is currently in review by City staff. A neighborhood meeting, to give all interested property owners a chance to learn more about the proposal and ask questions of the applicant and City staff, will be held on Thursday, July 12, 2018 at 6:00 PM in the Sonoran Conference Room at Avondale City Hall, 11465 W. Civic Center Drive, Avondale, AZ 85323. All are welcome to attend to learn more! Public Hearings have been scheduled before the Avondale Planning Commission on April 18, 2019 at 6:00 P.M and the Avondale City Council on May 20, 2019, 7:00 P.M. Both meetings will be held in the Council Chambers at Avondale City Hall, 11465 W. Civic Center Drive.